Nilan’s range of indoor climate solutions covers a wide field from ventilation- and heat recovery systems to compact total solutions which can both ventilate or heat recover, produce sanitary hot water, has comfort heating and comfort cooling plus heating of the home. Nilan Ireland develops and manufactures premium-quality, energy-saving ventilation and heat pump solutions. Nilan provides products that are beneficial to the environment and provide a healthy indoor climate and low-level energy consumption. The Compact P from Nilan is a modular compact system that offers not only one but several solutions. This enables you to select the solution most suitable to the size of your house and your family requirements. The Nilan Compact P solution firstly includes the Compact P basic unit. The Compact P includes a complementary ventilation and heating system providing your house with ventilation, heat recovery and sanitary hot water. It ensures a daily air exchange with the removal of dust particles, smells and excess humidity in exchange for a pleasant and healthy indoor climate. When it is hotter inside than outside the house, a built-in bypass makes sure to let cool air directly into the house. 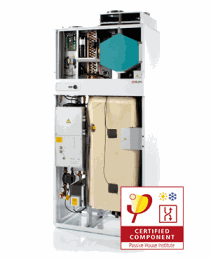 A Compact P solution with an outdoor air or ground source heat pump offers a total solution that covers central heating of the house as well. 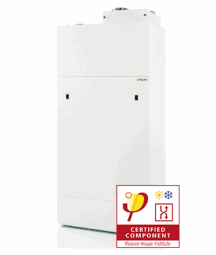 Compact P is one of only a few compact systems in the world, passive house certified due to its high efficiency. The certification means that the Compact P is pre-approved for passive housing without any additional documentation. Compact P GEO has the same features and benefits as the Compact P but can also use the energy stored in the ground to heat your home. With the Compact P GEO will your home be self-sufficient with renewable energy, and it is no longer necessary to use energy sources such as district heating, oil or gas for heating. Compact P GEO is an environmentally responsible choice for those who want to use renewable energy for heating of the home and at the same time use the benefits in the form of markedly lower heating bills and a good and healthy indoor climate. With help from ground pipes Compact P GEO uses the energy stored in the ground to heat your home using underfloor heating or other heating solutions at low temperatures. The system has an integrated 3 kW (Compact JVP 3) or 6 kW (Compact P GEO 6) geothermal pump. Both have a variable compressor which can be regulated 1.5-3 kW 2-6 kW (liquid/water temperature of 0°/35°C). This means that the solution adapts the need for heating, thus ensuring low power consumption. Compact P GEO solution can reduce your heating bill by up to 50%. For each kW of electricity the geothermal heat pump uses, you will get up to four kW back. The Compact P UVP has the functions, benefits and options of the Compact P but can also be used to exploit outdoor air to heat the home. When you install a Compact P UVP, your home will become self-sufficient in sustainable energy. Your home will no longer need to use other sources of energy, such as district heating, oil or gas. The Compact P UVP is the eco-friendly choice for anyone who wishes to exploit sustainable sources of energy to heat their home. This Nilan system allows you to reap the benefits of lower heating bills and a good, healthy indoor climate. 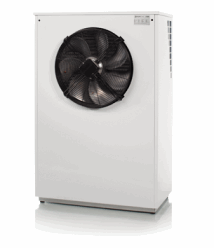 The system is equipped with an outside air heat pump which in contrast to the system itself is set up outside. The heat pump absorbs the energy in the outside air and converts this energy into heat. The heat is then used to heat water in your central heating system, which is then pumped to the radiators or underfloor heating in your home.